It is sometimes easy for me to forget that being invited to review the Musical Theatre works in our county is such a privilege. Last night, as I travelled home from CLOC’s rendition of Chess, I was reminded of that privilege. From the moment I sat in my seat and started to take in the detail of the stunning set to the fully justified standing ovation as the last echoes of the finale rang out I was captivated. What a show! 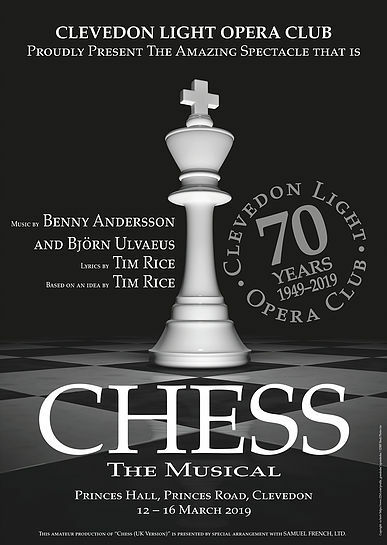 In celebration of their seventieth year CLOC had been looking for a challenge and in Chess they certainly found one: Almost sung-through in semi-operatic style but perhaps a little ‘plot-light’ the emphasis for success is heavily weighted on the quality of the delivery of Benny Anderson and Bjorn Ulvaeus’ splendid music. CLOC went beyond this and added a huge dollop of visual style in a beautifully presented stage setting: a starkly white theme was enhanced by chequerboard patterns, attractively integrated into Soviet and American Flags delineating the two opposing ‘sides’, sweeping staircases and raised platforms added height, movable light boxes gave flexibility, two room settings on down stage left and right enabled seamless scene transitions and some extremely impressive, animated projection on the cyclorama. 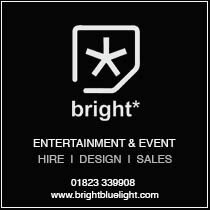 In addition a very well designed and delivered lighting plot enhanced an already stylish ‘look’ to a very professional level. The performances of the principals of this testing music stepped smartly up to the mark. John Prescott as Anatoly showed the quality of his voice to great effect (I am still murdering ‘Anthem’ as I write, John having nailed it), Tom Green’s Freddie Trumper was nicely nasty, Mark Mitchell’s richly Russian Ivan Molokov was a pleasure to watch, Mollie Kent’s benighted Svetlana was beautifully judged, Jonny Broad’s odious Walter de Courcey worked well and Emma Flaherty was calmly impressive as the Arbiter. In a field of very, very strong principal players, for me at least, it was the blockbuster performance of Kiana Ashton as Florence who stole the show. I remember Kiana well as Eponine in the CLOC Juniors’ production of Les Mis back in 2013. It is testament to CLOC as a society that such young talent is retained and returns to grace shows like this. The Ensemble worked hard and gave their ‘all’ with some great dance and song: Expectations for quality movement and dance in any show choreographed by Lois Bennett are high and she certainly did not let us down. The orchestra, under Musical Director Barry Smith, was particularly fine. The arrangement and delivery was, as far as I could tell, flawless with great dynamics: power or subtlety ‘on tap’ as the moment demanded. Sound, too was clear and well managed. Chess had the feel of a very slickly directed piece of theatre: Movement and positioning were precise, stage ‘pictures’ were attractive, stage management was smooth and the management of pace was equally strong. This success is particularly notable when considering the sad loss of Jeff Prescott, a hugely significant member of the Chess team in December. The impact on the CLOC ‘family’, in addition to Jeff’s own family of course must have been devastating. The success of the society: keeping going, banding together, supporting each other and delivering a great result, speaks volumes for the strength of all of the individuals involved and the strength of a great society. You can probably tell from the above that I very much enjoyed CLOC’s Chess. It was a show I will not forget in a hurry. So, was it perfect? Well…… I could not overlook a degree of hesitancy from the ensemble in a couple of numbers, a lighting cue was missed, a principal struggled during a short section of one song….but that’s about it. My notebook page is divided in two: good stuff and bad stuff: One side was almost empty. CLOC: Keep up the great work and keep on keeping on.